The protesters gathered to voice their support for continued protests in Iran and to call on the international community to support the Iranian people and their resistance movement for the cause of regime change in Iran. 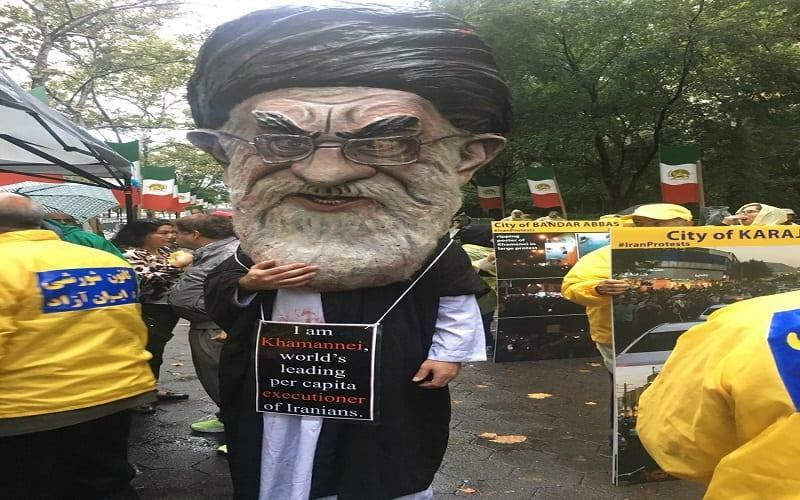 The protesters also, urged the international community to judge Rouhani on his deeds, not his deceptive appearance or words. They emphasized the ever-escalating discontent in Iran. According to the regime’s own officials, some10 million Iranians struggle with addiction and in a tight spot where %80 of the people live under the poverty line in Iran. However the country’s highest budget is assigned to the IRGC which has crippled other governmental systems by rocket manufacturing and transfer of arms for terrorist groups. Parallel to the regime’s ballistic weapons program and terrorism across the Middle East, the number of executions in Iran has skyrocketed during Rouhani’s presidency to 3400. Individuals who served in his previous administration, and those now picked as ministers, not only perpetrated the current barbarism, but also had a major role in the mass executions of 1988. His resent Justice Minister, Alireza Avaie, was directly involved in the 1988 massacre of political prisoners in Iran’s Khuzestan Province. Rouhani’s Minister of Information and Communications Technology, Mohammad-Javad Azari Jahromi, was an intelligence officer who had a key role in oppressing popular peaceful protests in Iran. Exiled Iranians emphasized that regime change in Iran is imperative and achievable, not by means of outside military interference, but from Iran’s own people and their organized Resistance, which is fully prepared to facilitate that change.